To be considered for this list of the top 10 most influential nature photographers of all-time, these famous nature photographers had to have left a lasting impact either on society or on future photographers. Most of these photographers can be considered revolutionary in their own right as opposed to evolutionary which is the category in which the majority of photographers fall under. There are many photographers in recent years who have made a name for themselves in the digital era but it is too soon to know who from this era will leave a lasting historical impact on future generations. For illustrative purposes, I've included a selection of my own nature photography within this article. Ansel Adams (1902 - 1984)– The grandfather of landscape photography. He is the one nature photographer that transcends the genre and even photography for that matter. His images are so well-known that photographers and tourists-alike are still trying to fill his tripod holes 60 – 70 years after his most famous images were made. Perhaps his greatest legacy were his environmental conservation efforts with the Sierra Club that led to creation of Sequoia and Kings Canyon National Parks among other areas, and also the art education institutions that he helped to create. Galen Rowell (1940 - 2002)– A well-rounded photojournalist with a special ability to connect with a vast audience through his writings, Rowell influenced countless photographers in multiple genres beginning with rock climbing, wilderness adventure and then eventually landscape photography in the 2nd half of his career. The list of current working photographers that have followed in his footsteps reads like a who’s who in outdoor adventure and landscape photography and number too many to list. He was one of the first to utilize 35mm cameras exclusively in outdoor photography and popularized the use of graduated neutral-density filters. William Henry Jackson (1843 - 1942)– One of the early pioneers of landscape photography, Jackson’s photos were instrumental in the creation of the National Parks system beginning with Yellowstone National Park in 1872. Not to go unmentioned should be the fact that this was essentially the first of a long-tradition of using nature photography as a catalyst for environmental conservation efforts. Eliot Porter (1901 - 1990)– In contrast with Ansel Adams’ big landscape style, Porter’s photos were more “quiet” and focused on the intimate landscape scenes that are easily overlooked. It is easy to overlook his body of work in favor of postcard views but one needs to only look at the photographers that he influenced to see that his work has left a lasting impact. Photographers including William Neill and Charlie Cramer have styles that bear a strong resemblance to Porter’s vision. His most famous body of work is arguably the book, In Wildness Is the Preservation of the World. 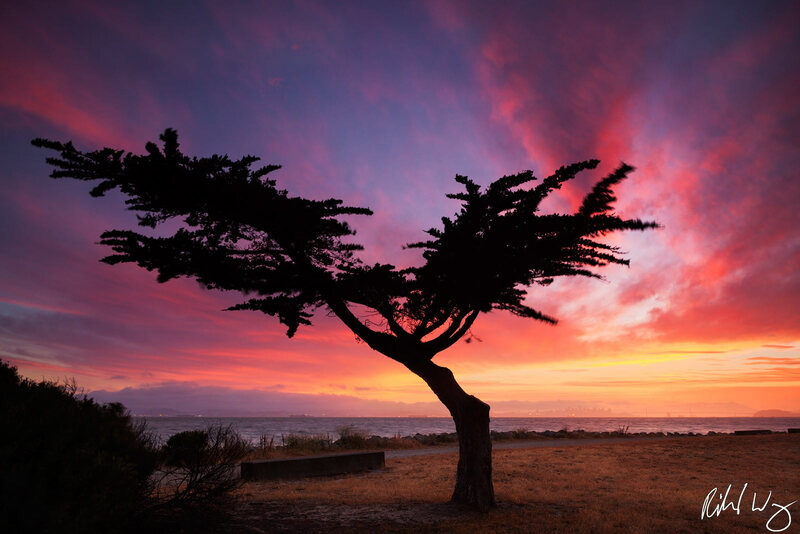 David Muench (1936 - Present)– Like Ansel Adams did with black and white landscape photography a generation prior, Muench is synonymous with color landscape photography. The now-common use of prominent foreground elements leading the eye through the frame to the background in the distance was a style that Muench pioneered back in the 50’s and 60’s. You would walk into any library or bookstore in America in the past 40 years and be hard-pressed to not see his books or calendars even if you don’t know his name. Carleton Watkins (1829 - 1916)– Created some of the earliest known images of Yosemite National Park which helped to spark interest in the western landscape. Philip Hyde (1921 - 2006)– A top Sierra Club photographer in the 50 – 70’s, Hyde’s photography was instrumental in campaigns to save southwestern landscapes from flooding due to dams including the Grand Canyon and Dinosaur National Monument which led to the birth of the modern environmental movement. A number of leading nature photographers cite him as an inspiration for their life’s work. Robert Glenn Ketchum (1947 - Present)– He is arguably the most prominent conservation photographer working today. His photography is actively used to further environmental causes in the American political system. His aerial photography of Alaskan landscapes are especially stunning. John Shaw (1944 - Present)– The author of several best-selling nature photography how-to books he is often credited with helping beginning photographers to improve their photography and is still a leading figure in the workshop market today. Arthur Morris (1946 - Present)– A sign of an influential photographer is one that is often imitated, and one would be hard-pressed to see any bird photography that doesn’t bear Morris’ influence. He is arguably the most prolific bird photographer of all-time and runs a successful birding workshop business. Art Wolfe (1951 - Present)- A prolific nature and travel photographer with dozens of published books to his credit. He was the host of Travels to the Edge with Art Wolfe which ran on PBS for several seasons. David Doubilet (1946 - Present)- Legendary diving photographer, best known for his work on behalf of the National Geographic. Subhankar Banerjee (1967 - Present)- His body of work from the Arctic National Wildlife Refuge brought international attention to the political battle over the use of ANWR public lands. I tried my best to remove my bias from creating this list by judging solely on resume and lasting impact on future generations of photographers. It is no secret that Galen Rowell was my biggest influence in photography but even if he weren’t, I would probably still rank him in a similar fashion. I’m also a fan of many more contemporary photographers so perhaps in ten years there might be some new names on this list that reflect the digital era. On the flip side, just because they are on this list doesn’t necessarily mean that I am a fan of their photography either but their accomplishments deserve to be recognized. With that said, I believe that valid arguments could be made for the ordering of any of the top four photographers on this list. 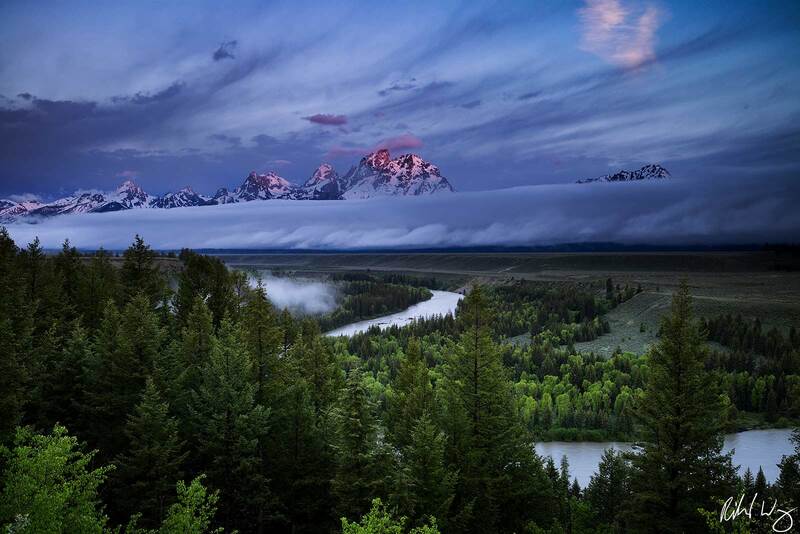 Ansel Adams (1902 - 1984) popularized this location with his "The Tetons and the Snake River" photo in 1942. On this late spring morning 76 years later, I was blessed with some fleeting magical lighting conditions. I own a copy of Adams' print in my office for inspiration but to be honest I prefer my own at this point. I hope you do too. Be the first to view new artwork releases, artist events and promotional offers. Really nice to see the includes of Jackson & Watkins, as well as Ketchum. Many young photographers might not have looked past the 1980’s or 1990’s for names. I’ll give one nod to James Balog as far as influential with what he’s currently doing with his Extreme Ice Survey. He’s certainly set himself up with the goal of trying to educate and influence an entire planet. Thanks Gary. I felt that photographers that had an influence on changing views in society should get the recognition in this context more so than photographers who take the most “awesome” pictures which is more subjective because in that case Frans Lanting and others would also be on the list. James Balog certainly had a real great documentary on PBS about his work someone I intend to keep following in the future. I’ll have to look into him a little more. Thank is a great write up Richard – good idea, these kinds of lists are great for debate, discussion etc. Personally, Art Wolfe would have made my list instead of a few different photographers, but otherwise, can’t really fault your list. Thanks Ron. Understandable and no argument from me on Art Wolfe. Really solid list, Richard. Inevitably someone worthy will be left out (Jack Dykinga, Carr Clifton), but that, I think, is more a function of personal preference. I wouldn’t critique the list as it is subjective. Your choices did give me some interesting characters to google though-thank you for more insight. I would remove Morris or replace him with Tim Fitzharris (the low angle shooting + clean backgrounds was his way earlier). As a European I would have to include Frans Lanting, he has influenced a generation of shooters. But my real ‘issue’ with the list is the absence of Jim Brandenburg, I can’t conceive modern nature photography without him. Carr Clifton is an interesting name that I was thinking about myself since he has been so prolific with the landscape calendars. For some of the older names you might learn more about them by seeing their stuff in the history or art museums. Hi Enrique. Others mentioned Lanting too on the NPN thread, so I’m wondering if he is a bigger influence amongst European photographers than he is in America? The reason I ask is because most cite him as perhaps the best wildlife photographer but I haven’t seen much talk about him being the guy that inspired them to go out shooting, stylistically or anything like that. Here is the NPN thread, and I just noticed the answer to my previous question. Richard, when I first read your post, I was thinking it should be easy to narrow it down to a top 10. But when actually putting names in there, it can be difficult because there is probably a top 15 or 20 or so trying to squeeze in there! Carr Clifton wouldn’t be a bad choice. Art Wolfe would be in mine also, along with Jim Brandenburg or perhaps Thomas Mangelson. Of course, I would want Joel Sartore and Brian Skerry in there as well from all their Nat Geo work. Very hard list to compile afterall. Hey Mark. I had the same thoughts. I felt really solid about the first eight photographers but had to think much harder about the last two and after seeing all of the varied responses I would probably swap out one or two from my original list. That seems like another blog post. Yeah he’s definitely the man. I ran into him at his gallery at the grand opening and was really impressed by seeing his stuff printed large. His book, Life, is truly an amazing piece of work and perhaps his best yet. Hi Richard, Thanks a ton for including me on your list; it is beyond a great honor. I do hope that our paths cross some time. You’re welcome Artie. You are a fantastic photographer. I did not see Edward Weston on anyone’s list. I would put him in any list of most influential. Hi Mike. To my knowledge, Weston wasn’t really a nature photographer. If he was, probably not to the effect that the others were. I am sure the lists of other photographers will reflect a personal taste. It has too…that’s why it’s an “influence”. Yes to Adams but more for his role in the craft of photography. Eliot Porter and Galen Rowell are both really strong influences. These four are manditory for inclusion: Edward Weston, taught us how a print should look, not to mention giving us Brett; Henri Cartier-Bresson, he taught us how to see; Joel Meyerowitz, he taught us to see in color and Jerry Uelsmann taught us photography is art. The following three are personal choices…but just look at their work and you will get hooked too. They are Christopher Newbert, look at his book “Within A Rainbowed Sea” and you will be blown away; Art Haseltine, the only underwater photographer I have ever heard that uses a medium format camera to shoot black and white film for underwater images and the best large format photographer working today is Christopher Burkett. Hi Gary. No doubt that the Westons and Cartier-Bresson are influential photographers in other genres no doubt but the post was about listing the top nature photographers. As with Mike’s comment, the Westons were known for their art / still life work and Cartier-Bresson was a street photographer but had no involvement with nature photography. That part is not subjective. I’ll be sure to check out your personal choices. I’m always interested to see what else is out there. I’m familiar with Burkett’s work already and agree that he is good. I took advantage of the lose interpertation of landscape and inclued all work done outdoors and without a huge array of lights, assistants, etc. I hoped you were looking for influences that worked alone in the outdoors and contributed to the genre of nature photography. Without Cartier-Bresson, we would not understand how to use the “miniature camera” without strobes and tripods. I don’t think I need to defend myself with Weston: he was a photographer of nature. And, please take the time to check out Newbert. He is the best underwater photographer, bar none; he is the standard. His images are the ones everyone looks at and becomes speechless. Thanks for your time. I hear where you are coming from Gerry. Thanks for elaborating. I see Cartier-Bresson having an influence over most photographers for his “decisive moment” philosophy. It could be argued that capture the light just at the right moment is pure Cartier-Bresson just as the little twinkle in a grizzly bears eye. I just had a chance to check out Newbert’s work and there is a lot of fascinating stuff on his site. Very exotic and I like how he makes the marine wildlife look artistic in some photos. Christopher Newbert’s “Within a Rainbowed Sea” is a must have. To fully appreciate his work, get a copy of the book. Mahalo and Aloha. Good to know Gerry. I will look up those books on Amazon when I get a chance. I’m always on the lookout for good photo books. One of my personal favorites, Clyde Butcher. Google him. For urban nature, Claudio Edinger. Thanks guys. Clyde Butcher is in Outdoor Photographer magazine from time to time and has some nice b&w work from the Everglades. Thanks Sabyasachi. Regarding the websites, not all of the photographers had websites when I looked into them or weren’t as informative as the links that I provided here. So my list would include Art Wolfe. He’s prolific, good teacher, good communicator, inspires many beginners and amateurs, conservation ethic is strong. If Weston qualifies per one commenter, how about Ernst Haas? http://www.ernst-haas.com/ Very inspirational to me. I second the Mangelsen and Brandenberg mentions. Art Morris is the great bird photographer but not sure that gets him on my “most influential nature photographers” list. The rest of your list is solid. Don’t see how Subhankar Banerjee has the body of work or influence to make the list. Thanks for the input, Tom. Regarding Art Morris, if you’ve seen several of the nature photography forums online then you could probably have a good idea for why I included him on the list because there are a lot of bird photographers out there and most seem to have been influenced by him to some degree. As for Banerjee, his ANWR book being passed around the Senate helped bring the topic of oil drilling on the North Slope into mainstream discussion and it has been a point of contention since. To me that is pretty significant. Thank you Richard for putting together an excellent list. Though my list would differ some, I am glad you included my father, Philip Hyde, who has often been under appreciated for his contributions to photography. I am surprised you did not include Edward Weston, Brett Weston, Minor White, John Sexton and possibly Carr Clifton and Jack Dykinga. Clifton, Sexton and Dykinga are perhaps not as influential as some, but they would fall into the category you mention of making by far the best photographs. The Westons and Minor White, it has been argued, were not strictly nature photographers. However, they not only made some of the greatest landscape photographs of all time, but have influenced all of photography. Back when Adams, the Westons, White, Porter and Hyde were first working, nature photography was not even a term. In fact, photography was not even recognized as an art. People before them had made photographs of nature, but without these pioneers, those photographers would remain in obscurity, as perhaps would the whole genre. Edward Weston was an example not just in photography but in lifestyle. He did not jet set all over the globe or own a lot of fancy equipment. He lived a very simple life, close to nature. When Ansel Adams started the first fine art photography program at the California School of Fine Arts, where Philip Hyde was in the second class, the art students in other departments flew into an uproar, protesting that photography did not belong and would ruin the reputation of their school. Photographers today think the field is tough with all of the competition, but back then there was no market. The photographers I mention, helped to establish the West Coast Tradition, involving Straight Photography, simple, clean compositions and often, natural subjects. I know there are talented and even influential Europeans, Australians and East Coast Photographers, but if we are talking about nature photography, it was pioneered in the Western U. S. Adams, Porter and Hyde went on to help the Sierra Club and other environmental groups protect more wilderness than anyone else in photography ever did or probably ever will. Adams was an advocate for photography and wilderness his whole life. Porter and Hyde brought color to the medium. Porter’s books were the best sellers. Hyde was young, poor, desperate and talented. He was able to drop everything and run off to unknown places at David Brower’s bidding and thus more of his images were used in the famous Exhibit Format Series than any of the others. Thanks for sharing further insights, David. If there is anyone qualified to speak on subject, it would be you since you were probably there first-hand during this time. I agree about the Western landscape photographers. Others might feel slighted but the genre and the modern environmental movement was pioneered in the West for the most part. Your dad definitely had a big role in that. I was born in 1965 when my dad (Philip Hyde) was 44. I missed the earliest “pioneering” but certainly met many of the cast of characters. As background for my book about Dad, I’ve done some reading both in books and correspondence about that piece of the history of photography and how it intertwined with the beginnings of modern environmentalism. There are valid and diverse perspectives. In what I said above, I certainly don’t intend to invalidate Europe’s development of photography or environmentalism, or that of other regions. I’m saying that the photographers who gathered to protect the national treasures of the American West, played a major role in popularizing both photography and conservation on a global scale. They taught the people who are teaching photography now, while their photographs led to views changing about the environment, to the point that it is now cool care about the planet. This is a great idea. I have been amazed for years about the ignorance of especially younger nature photographers about the icons who created this art form. Many have never heard of Eliot Porter or Phil Hyde, which is criminal. My only comment on your selections would be that Porter has to be number two (and not the new number two) because I believe he invented color nature photography. To me, the true artist is the person that does something first, and all color work flows from him. I also believe that he, along with David Muench created the large number of baby boomer nature photographers. These people used large format, have done an amazing body of work, and won many environmental battles with their images. True, Galen inspires a lot of people, and I am may be just splitting hairs here, but I think Porter is the more influential force. Also, Art Wolfe has to be in there. More people have been exposed to nature photography though just his tv show than any other photographer except Adams. Thanks for your thought-provoking blog. Thanks Tom. I had been waiting to hear some thoughts about placement of the top four and you make great points about Porter and Muench. I find it fascinating that Muench has been around since the 50’s and is still active. His career spans almost the entire history of color photography. I haven’t heard of Jackson or Morris, met Ketchum. It’s a good list, I would create something very similar but I grew up in the in similar locations and at about the same time you did Richard. I don’t think people in other countries or the opposite side of the country would have a similar list? Thanks Steve. I would say that Jackson should be essential knowledge for all nature photographers. True that international photographers would have some names that I didn’t list but I have a feeling that most lists would have about half of the names listed here if they did their homework and understand how the genre came to be what it is now. I get your point, Nance, but I don’t think that any nature photographer would consider either of those two as nature photographers. Now that photography is more popular amongst the general public maybe we will have more women become influential in this genre in the coming years. No way does Galen Rowell deserve to be #2 and Jack Dykinga not even be on the list. That is nuts. I see the resemblance in Clifton & Dykinga’s work but I feel that Rowell’s approach to photography was more of a street photographer / photojournalist than Muench. The only similarities I see there are the fact they both shoot landscape photos. Thanks for the suggestion, Ben. I’m not familiar with him but will check out his work. Hi Ben. I looked at Mr. Holmes work and he has great work. Though, I would encourage you to re-read the post and notice the topic is about most influential nature photographers, not about who I think is the most creative or most talented though the names on this list are well-renowned in that regard as well. Great list Richard – Personally, I’d put Galen on top, but that’s due to my own bias about his influence and impact on my own work. Influential – a new-comer to the list: Clark Little. He has developed a new genre of surf photography. Amazing work with the turtles. Thanks for the input, Kelly. I have heard of Clark Little and like his work. Very talented photographer. For me, being relatively new to photography as art, I would put Mr. Adams number one as well. But someone I didn’t see mentioned even in the comments, and someone that when I bring is name up to people who claim to be serious photo people I get “the look” and sighs..is Peter Lik. Other then the ansel Adams I hadn’t heard of a single person on the list. Again, I am not someone who grew up “in the life” or took classes or any of that. But just because someone has commercial success should not mean they are over looked or treated with distain for it. I mean, Peter Lik managed to bring a Photography show to a major cable network during primetime. He’s introduced tens of thousands to the hobby, myself included. That seems pretty influential. And it’s not like he’s a new comer. He’s been a pro photographer for twenty or thirty years. I’m not saying he’s the best, or most well known or perfect or any of that. Just that, if nothing else, he’s had a pretty substantial impact, especially to the casual person. I bought my first camera because of him. (in 2008) and I love his work. Can’t afford it. Lol but love it. Thanks for the comment, Ty. As for Peter Lik and his TV show, that hadn’t happened yet at the time when I had written this. He has a lot of galleries but then again Tom Mangelsen also has a lot of galleries in heavy-trafficked locations and has been in that business a lot longer. Mangelsen also seems to be respected more within the field than Lik. Art Wolfe had his TV show on PBS before Lik as well and curiously had a similar title. With that said, I do have respect for Mr. Lik’s business-savvy. He’s created a good thing for himself. Just a few thoughts: It is hard to say any new innovative work is being done today. It seems to me Photoshop skills are more in demand than true art production. Yes, I acknowledge the final print through Photoshop can be considered a work of art. But, this is not really a debate about traditional photography versus digital work. This a debate about how photo skills are transferred to others. Adams, Weston and Rowell distributed their knowledge through the written word as well as their artwork. Photographers today do not share their knowledge that freely. The TV programs seem to me to showcase the photographers work and not share their art and craft to the point the work can be duplicated. I want to see new work from new photographers. I enjoy learning how they do their art production. That does not make for good TV, I get that. Lik and other video stars are more personality than influential nature photographer, at least as far as our current “education” videos indicate. It takes time and effort to become proficient. Their example of an excellent work ethic is what is missing from most current photographers. This will make them influential. Hi Gerry. I’m not sure that it’s not because innovative work isn’t being done, but what’s considered “innovative” these days oftentimes is more likely to be the result of Photoshop post-processing technique than it is about photographing it in-camera. There are some photographers that have unique vision though like Guy Tal. His best work doesn’t really look like other people’s work at all. Richard – I find myself agreeing with 90% of this list, but in my own (somewhat humble) opinion, I would have put Art Wolfe in the top ten. I’m glad you included Galen Rowell, his work is some of what inspired me to pick up a camera years ago. Excellent broad representation of photographers, but I have to agree that this list is lacking without Art Wolfe and Jim Brandenburg, especially the involvement that both of them have with conservation issues – so many of the others on this list have broad diversity and are involved in conservation issues. I can’t argue with that list at all. I would add a couple of names to the honorable mention list. Michael Frye has really helped define and promote Yosemite in the “post Ansel” era, and I’d say is the symbolic leader, or one of the top few, of what I consider the “Yosemite mafia” elite photographers. George Lepp has done some really amazing nature work over the years. I’d rank him near, if not equal to, Art Wolfe, but perhaps not quite as strong at self-marketing. (that should not be intended as a slight at Art Wolfe, by the way. taht’s an important skill for photographers). And I’d include William Neill, because his interpretive style is so different from the “typical” landscape photographer and has been so influential to so many others. Thanks Carl & Chuq. I will have to compile a list of the photographers that have been suggested by others and do a follow up post. Between this post and associated threads on photography forums, there are a couple of names that definitely stand out. Richard – My point is the dependence on Photoshop and not so much on a personal style obtained through years of shooting, editing, re-shooting and exhibiting personal choices. Good art production takes time and effort. I just want to see more photographers showing us a good work ethic. I have to admit that I am ignorant when it comes to current work by current photographers. I will look into Brandenburg, Tal, Neill. As an aside, I want to know more about digital versus photographic production…hope this becomes a line of discussion. Agreed, Gerry. I think people’s definition of photography has definitely changed over the past few years so it will take a while to figure out what stands the test of time. I don’t have an answer for that as that seems to be a topic that spurs a lot of debate. Peter Dombrovskis a major influence in Australian (Tasmanian) history his photos were influential to stop the damming of the Gordon River in Tasmania. Good to know, Ian. Peter Dombrovskis was also mentioned by another photographer when we were discussing this topic on another site. Thank you Richard for the list. how about John Paul Caponigro? He has a very nice portfolio. Hi Venura. I’m not sure he belongs on this list, as I think he’s more known because of his dad (Paul Caponigro) and also as an Adobe educator, more than for his nature work itself. Interesting list, and interesting discussion that followed the publication of it. Thanks for that in advance. I’m not giving you a new top 10 of my own, but the one I’m really missing indeed is Jim Brandenburg. Not only is he a great allround photographer to my opinion, but an inspiring person as well. Hi Henkjan. You certainly named some very highly-regarded photographers and a case can be made for them as well. Looks like I’m a bit late to this game, but great post and comments none the less. I agree with some of the comments and with the majority of your original list, though I just about choked on my coffee when I saw someone bring up Peter Lik. Photographs aside, I think you should get huge negative points for over saturation and nefarious business practices. Anyway…. Also, big support for David Meunch. He is a walking history book on the evolution of modern nature photography, and his large format work still blows me away with its simplicity and scale (I’m a sucker for his near/far compositions, and have regularly found it creeping into my work). I’d definitely have to include Jack Dykinga. Speaking of composition, he probably has some of the most amazing versatility I’ve seen. He’s just as comfortable capturing amazing wildlife moments with a long lens as he is creeping up practically inside a cactus with a 14mm. He’s got simple compositions that are all about color differentials, and compositions so complex it took him a half hour to set up correctly. Really blow your mind stuff. Plus, once you get him talking about his Chicago days as a photojournalist, you’ll never want him to stop! Thanks for the interesting comments, Hank. It’s not really my place to judge Peter Lik on this blog or other photographers for that matter, but your comments are not the first time I have heard that sentiment regarding him. Good point about Jack Dykinga. I don’t know of any other nature photographers that can say they have won a Pulitzer Prize (it was a long time ago for different subject matter). He has great work. I have seen it on display at Galen Rowell’s Mountain Light Gallery in Bishop. Having been recently “stung” after entering a nature photography contest that I thought I could at least place, I am surprised by some of the images that did place. I think contests are so biased and subjective, I really don’t see the point to entering them any more. I have met very few judges who can really pick images on an objective basis. I definitely subscribe to the less is more approach of images that Eliot Porter took. Sometimes I think that people who view photographs just don’t get good composition, use of design elements and the use of light. If a photo doesn’t have colors that knock your socks off or elicit a WOW then it isn’t good these days. Sad. Thank for your list I think it reflects some of the best work ever done in photography. Thanks for the comments, Phillip. In regards to photo contests, I think sometimes the results are watered down and safe because if there are multiple judges then it’s usually a compromise to pick a winner. I have only entered in a few myself and never won anything only to see cliched icon location photos win. The issue with going for over the top type of photos is kind of like candy. Candy satisfies a quick urge but it’s not something you really savor unlike a fine wine. Fine wines aren’t meant to be enjoyed while skipping down the street or in a shopping mall but definitely more enjoyable when you spend some time to experience it. I did not see any Canadian Photographers in your list. You should do more research, as you have picked the most obvious photographers. Feel free to name some, and who would you replace off of the list? Thomas Mangelsen… love his photos. He is definitely one of the greats. Thanks. I think your list is excellent although it’s a bit like a top 10 list of greatest rock guitarists, you can never stop at 10. There are two names that I do not suggest adding to your list but I’d like mention them to point out their enormous impact on Nature Photography. The first is Alfred Stieglitz who was photographer but I mention him more because he had a huge influence on the careers of both Ansel Adams and Eliot Porter by giving them shows in “An American Place” and by promoting the art of photography in general. The second is David Brower who’s vision channeled the work of so many photographers in a direction that allowed their voices to be heard by the larger public and for photography to be a force for the environment and conservation. Very true, Tom. If anything I created this list to create a discussion. Judging from the previous comments every person’s list would likely look different to varying degrees. Stieglitz and Brower each had an indirect influence that ended up shaping the course of how things played out. Both historically-significant in their own right no doubt. Nice review here. I’m reminded of some names I would not have remembered, but it seems all on your list, and even those mentioned in comments come alive when I read their names, and some of these are heroes to me. Galen Rowell is one. I note that so many great photographers live somewhere in the west. One exception is Jim Brandenburg I know, but the west must be inspirational. It is for me whenever we can get out there. Each state is unique. Greg Lawson is another worthy of mention in this conversation. I don’t know how historic he is but I’ve been to his gallery in Arizona and he covers a lot of ground the work is very impressive. Though I found this it late, thanks for a good rundown, even though I see its hard to do a top ten unless you’re David Letterman. I recall reading a magazine article listing the top 100 photographers once and I knew very few on that list. Thanks Jan, glad you got something from this post. I’ll have to check out Greg Lawson. I’m not familiar with his work. What about the women? Linda Connor? Annie Brigman? Lauren Gilpin? Dorthea Lange (Ireland)? Cunningham, even? And Christine Mittermeier, is the main person to start the conservation movement. https://www.mnn.com/leaderboard/stories/meet-the-woman-who-elevated-conservation-photography-to-a-whole-new-level Dude seriously! We’re all entitled to our opinions, and Christina Mittermeier has certainly accomplished a lot but I disagree that she started the conservation movement. Conservation photography started before she was even born. Maybe it wasn’t called conservation movement at the time but the works of Ansel Adams, Philip Hyde, William Henry Jackson, many of the people on my list were used to establish many of our national parks and national monuments. Richard is absolutely correct. The NYT Obituary for Philip Hyde is entitled “Philip J. Hyde, 84, Conservation Photographer” (https://query.nytimes.com/gst/fullpage.html?res=9C05E3D6173FF93AA25757C0A9609C8B63). By the way, with all due respect to her accomplishments, I don’t think her “sacrifices” (quoted from your link) compare to Philip Hyde’s life choices. As for the main list, I believe the two last entries simply do not belong in the same category as 1-8, which is solid, although rank is subject to debate. Watkins didn’t just “spark interest in the western landscape”, his photographs were instrumental in the passage of Yosemite Grant of 1864, which is the first public lands protection act, and his work predates William Henry Jackson’s by a decade. Thanks for chiming in, QT. Given that nearly ten years has passed since I originally wrote this and all the comments received, I would probably re-evaluate this list if I were to update it. Thanks Michael. I agree that the real gem of this post is in the comments. My own views are just my own and I did learn quite a bit from all of the comments. Top 100 would be quite something for sure, and I think you would have a great shot at making that list. That is an interesting closing thought. Vivian Maier was totally unknown until recently; many years after her death. Maybe she was content just doing her own thing in obscurity? Posted in opinion, editors choice and tagged famous nature photographers, nature photography, nature photographers.